We are working on R&D projects continuously. If you need a partner for an R&D project which fits to our knowledge and portfolio please contact us. Since 2012 working on this project we investigate Magnesium components for EYE and it's payloads. In future EYE parts based on this project maybe integrated. This was the initial project for the development of EYE09. to develop an ultralight drone structure optimized with high end composite engineering technology was the base idea. Refer to EYE.AERO to see the result. In our research project SkyObserrver we developed a 3-axis retractable gimbal. 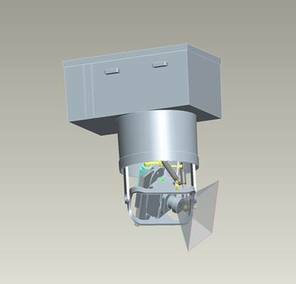 The integrated cam is an industrial daylight cam with integrated DSP and FPGA to be able to process video data onboard. The weight of the cam only before integration was about 550g. Integrated to our 3-axis retractable gimbal for a fixed wing UAV the complete system has a weight of about 205g! This shows you that EYE.AERO is able to integrate sensors to our payload limit which you normal not consider due to their base weight. The task of this project was to design and evaluate a new type of composite metal structure interface. Working in a team of many industrial and research partners our part was to support mechanical design and data exchange to analysis team.